The Network for Business Sustainability recently articulated their “Top 10” sustainability challenges for Canadian business in 2013. I think many readers will probably agree these challenges face businesses around the globe as well. One challenge in particular caught my attention, in light of some of the challenges I‘ve encountered myself, working with public and private sector companies in Canada and internationally: How can companies keep their long-term sustainability agenda on track despite leadership changes? I have witnessed several examples of disrupted sustainability agendas, even among organizations that had done a phenomenal amount of work to advance sustainability. In my experience, it is typically the departure of a committed CEO or Board chair that leads to gradual erosion and sidelining – sometimes intentional, sometimes inadvertent – of corporate responsibility and sustainability initiatives over time, often accompanied by a sense of frustration among team members and stakeholders. In my view, this challenge highlights the critical need to differentiate between operational and cultural integration of sustainability. Most discussion papers and guidance pertaining to sustainability integration deal mainly with the integration of sustainability into business processes: this is operational integration. However, operational integration must not be mistaken for cultural integration. Cultural integration involves the integration of sustainability into corporate vision and values, and the embodiment of those values in the behaviour of individuals within the organization. Both are critical success factors to advance a sustainability agenda over the long term, and indeed they are complementary. Can you have cultural integration without operational integration? Sure, but there’s a good chance the sustainability agenda will not be fully realized. We’ve probably all seen examples of organizations populated by well-meaning individuals who share a belief in the need to be more sustainable, but whose efforts are stymied by the lack of effective integration of sustainability considerations into routine business processes. Conversely, you can have operational integration without cultural integration, although this is usually more difficult to recognize. In this situation too, the sustainability agenda is unlikely to be fully achieved. Operational integration without cultural integration can happen when an organization reactively pursues a sustainability agenda – perhaps in response to stakeholder pressure or a perceived reputational risk – without taking the time to understand why, and to develop a clear, thoughtful, and shared vision. A committed leader may also achieve a degree of operational integration through sheer strength of character, but may overlook the importance of ensuring their executive colleagues and the Board, not to mention the employees at large, share their vision. It is where cultural integration is lagging that the sustainability agenda is most at risk of become derailed during and after a change in leadership. 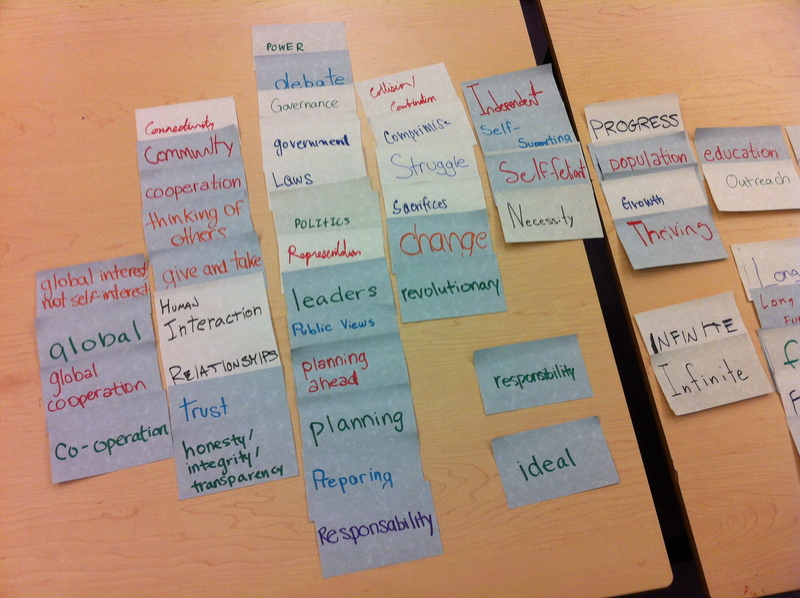 Organizational vision and values are fundamentals that will guide an organization through times of change. It is therefore worth taking the time to carefully consider the reasons for pursuing sustainability and crafting a sustainability agenda that is aligned with and supportive of the organization’s vision and values. An organization that values sustainability leadership as part of its culture, and considers sustainability to be a core part of its strategic vision is more likely to enjoy continuity in its sustainability agenda, even through a change in leadership. One way to enhance cultural integration is to have broad engagement with the Board, the executive/management team, and employees during development of the long-term sustainability agenda, particularly with respect to ensuring alignment of the sustainability agenda with the organization’s vision. This increases not only understanding and buy-in across the organization, but improves operational integration as well. The greater the degree of cultural integration, particularly among the Board and executive, the more likely it will be that commitment to sustainability will be a factor in the consideration of new leadership candidates. This, too, will do much to assure the continuity of sustainability in the midst of change. What do you think? I invite you to share your experiences and ideas here, by clicking on the Write Comment tab, or join the discussion in the Canadian CSR and SD Practitioners Network on LinkedIn by clicking here. Last month, I had the opportunity – and the privilege – to participate in the Maximum City program in Toronto. This program is the brainchild of Josh Fullan, a high school humanities and languages teacher at the University of Toronto Schools, my alma mater. Last year, Josh ran a pilot program that brought a small group of students from two Toronto-area high schools together with a team of experts and professionals in a wide range of urban disciplines, including architecture, design, planning, transit, municipal governance, community development, and communications. 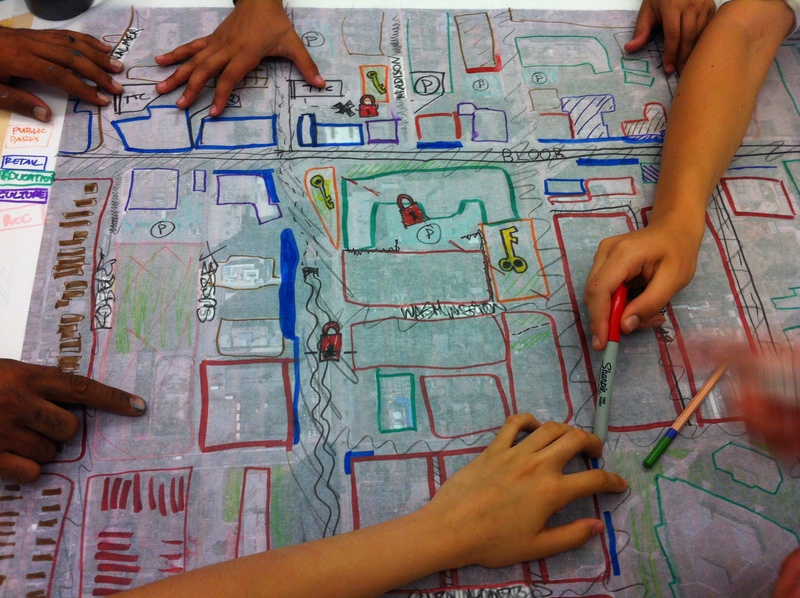 Over the course of a week, the students listened to lectures and took part in design exercises and field trips in a series of modules that exposed them to new ideas and key concepts in urban development: Built City, Planned City, Engaged City, Transit City, Liveable City, Pedestrian City, Governed City. 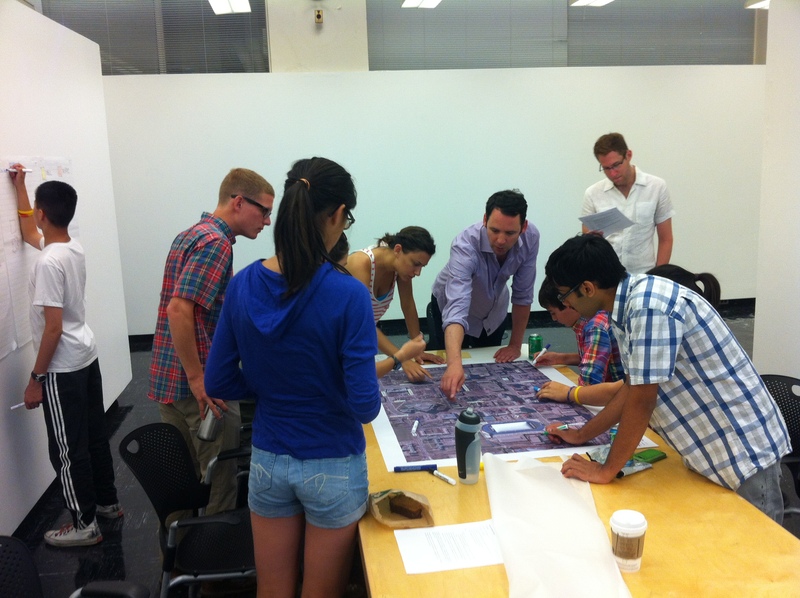 The week culminated in a neighbourhood visioning study and design charrette. The outcome? A small but thoroughly engaged group of young people with a deeper appreciation of the complexity of urban issues and solutions. When I read about the program last summer, I thought it sounded terrific – the kind of thing you wish they had when you were a kid! But I couldn’t help noticing there didn’t appear to be any content explicitly dealing with urban sustainability. So I called Josh to tell him so. A few lunches and many emails later, I found myself on a flight to Toronto in the middle of July, busily finalizing my notes for the introductory module to this year’s program. The theme of Maximum City 2012? Sustainability. We talked about interdependence and interconnection and integration. And I asked them to look for these relationships and linkages in all of the other modules, which spanned two weeks and covered even more topics than last year’s pilot program (Park City, Smart City). 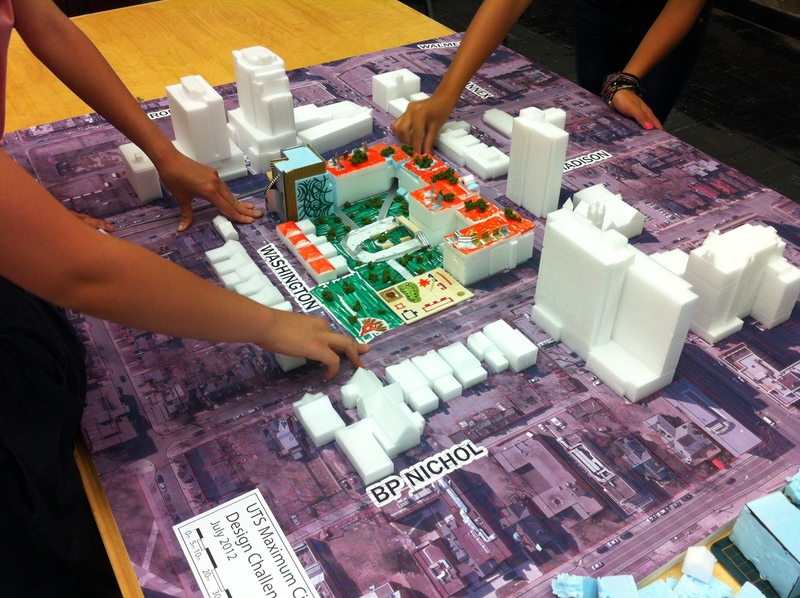 Once again, the program culminated in a design challenge, which this year had teams of students redesigning an underperforming city block with a focus on sustainability. 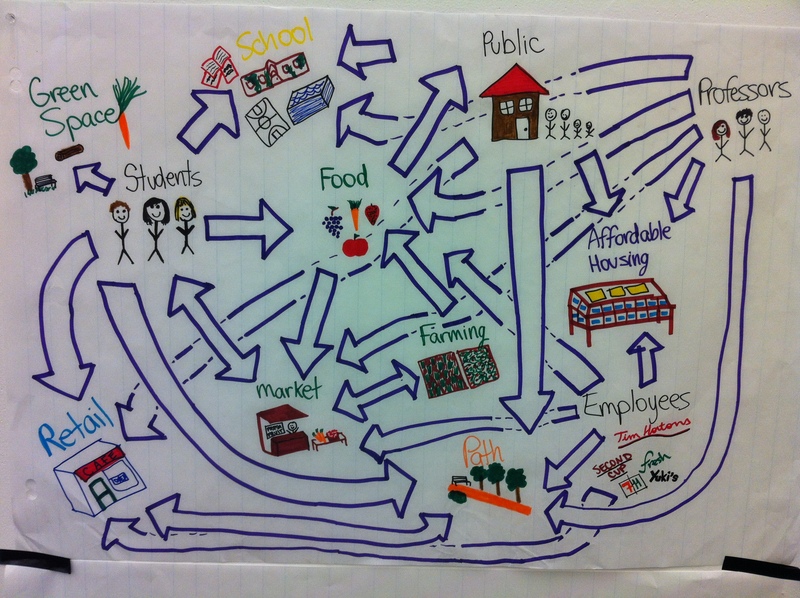 As a resource person and member of the critique panel, I had the opportunity to watch the students move through mapping the neighbourhood, identifying challenges and opportunities, and conceptualizing and actualizing solutions. I was totally floored – and inspired – by the creativity and capacity for synthesis and problem solving shown by these students. 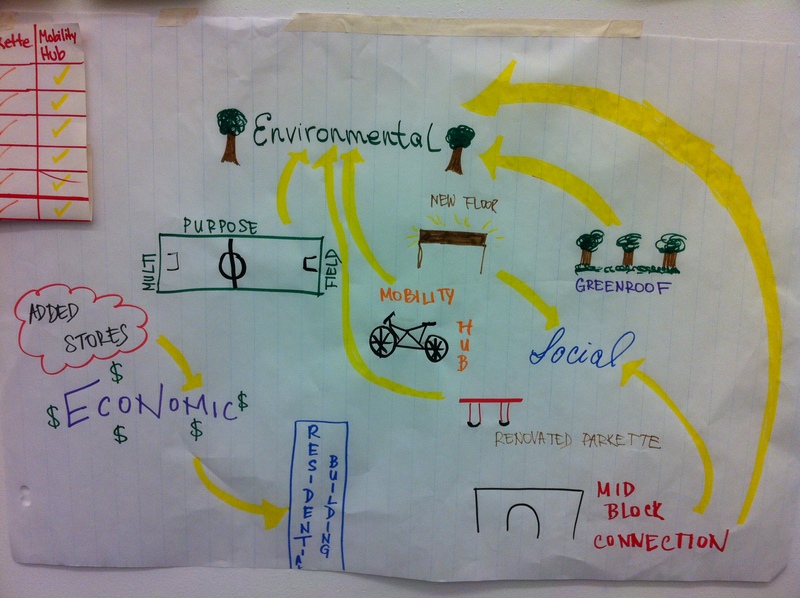 Their quick grasp of key concepts is demonstrated by these ‘mental maps’ one group created to explain the elements and linkages included in their neighbourhood vision. 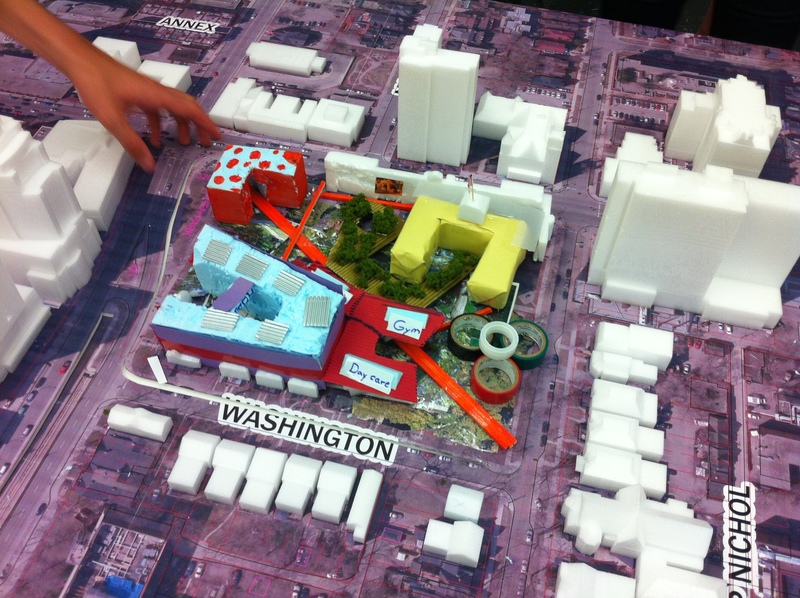 In a matter of hours, the students’ ideas transformed an underused and unwelcoming city block into a hub of social interaction, economic diversity, and improved environmental performance, with improved connection to the surrounding community and a more productive use of urban space. The Maximum City program is driven by Josh’s vision that young people can be key contributors to understanding and shaping our rapidly urbanizing world. Indeed, as I witnessed the students getting more and more engaged through the program, I was reminded that youth have their own ways of seeing, interpreting, and interacting with the urban landscape, and there is great value and potential opportunity in integrating those perspectives into the dialogue of city-building. Sustainable development is, after all, about meeting the needs of the next generation as much as our own. If you are interested in urban sustainability – and if you live, work, or play in a city, how can you not be? – I encourage you to check out this program, maybe start a similar program in your own city, or find a way to engage youth around issues of sustainable development. You’ll likely come away inspired, encouraged, and motivated, as I have been. 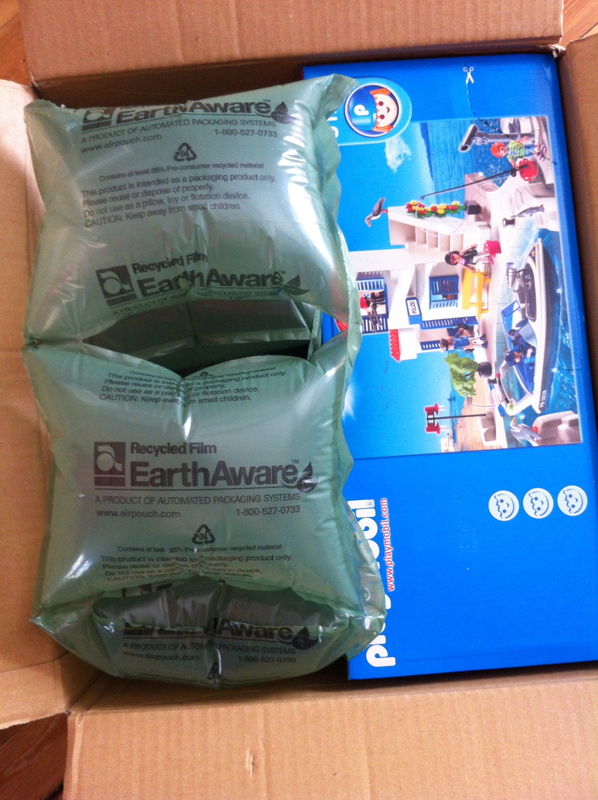 Not only was the outer box appropriately sized for the contents, but they used Automated Packaging Systems’ “EarthAware” recycled film air pillows to fill the empty space. This packaging contains at least 95% pre-consumer recycled material, and I can recycle it where I live. Of course, the cardboard boxes themselves are recyclable. Areas for improvement? They could probably make the set boxes themselves smaller, and use recycled-content plastic packaging for the pieces inside. There’s also no indication that the semi-glossy paper used for the assembly instructions has any recycled content. And I still can’t find any corporate responsibility or sustainability information on their website. But I’ll flag a good thing when I see it. Qatar has something every country needs. I’m not referring to oil or natural gas, although Qatar has both in abundance. I mean a national vision of and strategy for sustainable development. 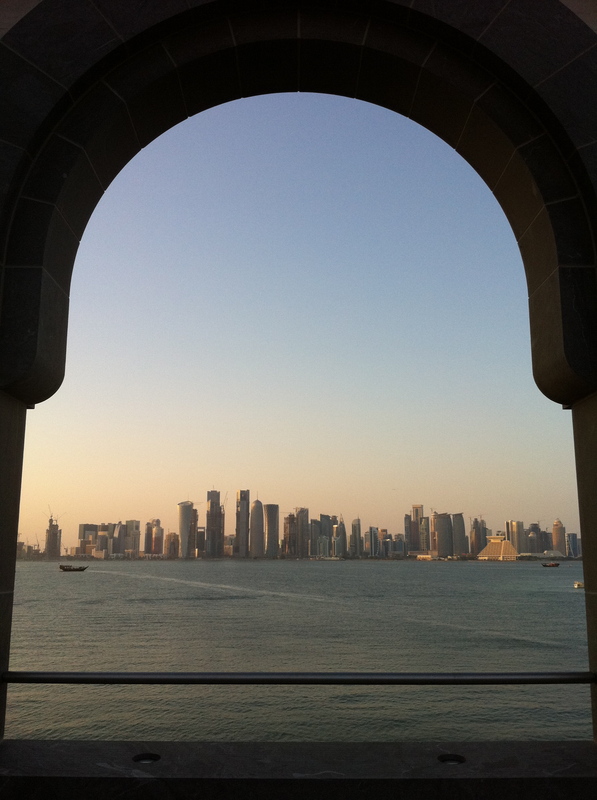 In less than a generation, Qatar has experienced huge economic and social transformation. The discovery and development of its hydrocarbon resources has fuelled – pardon the pun – Qatar’s economic growth from a small nation dependent on fishing and pearling to one of the highest per capita income countries in the world. In the face of that rapid expansion, however, new challenges have emerged. Qataris now need to balance modernization with the preservation of values and traditions, a priority in a country where 80% of the people are expatriates. They must also figure out – as we all must – how to achieve economic and social equity for present and future generations while protecting environmental health. 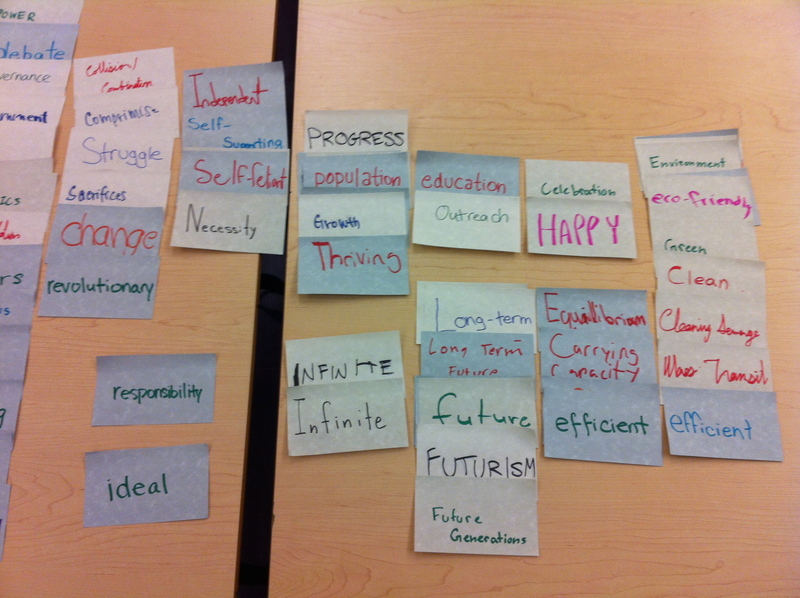 Recognizing these challenges, Qatar embarked on an initiative to define the characteristics of the country’s future. The State established the General Secretariat for Development Planning, which undertook multi-stakeholder consultation across Qatar. The Qatar National Vision 2030 is the product of that initiative. Click here to read on about the key elements of Qatar’s sustainable future!